I get a snack craving several times a day. If I’ve planned ahead and brought some food with me, I end up making a wise choice. If I don’t plan ahead, I’m left to scrounge the available nearby options, and I often end up making a convenient, less-than-ideal choice. Most of my snack needs arise during my workday. As I’ve noted before, I feel strongly about making sure food I bring to work is healthy for my own benefit but also if there’s a chance my coworkers are going to eat it along with me. This could be at our weekly afternoon card game, at a staff meeting, or just standing around the copy room waiting for our copies to print…and grazing. 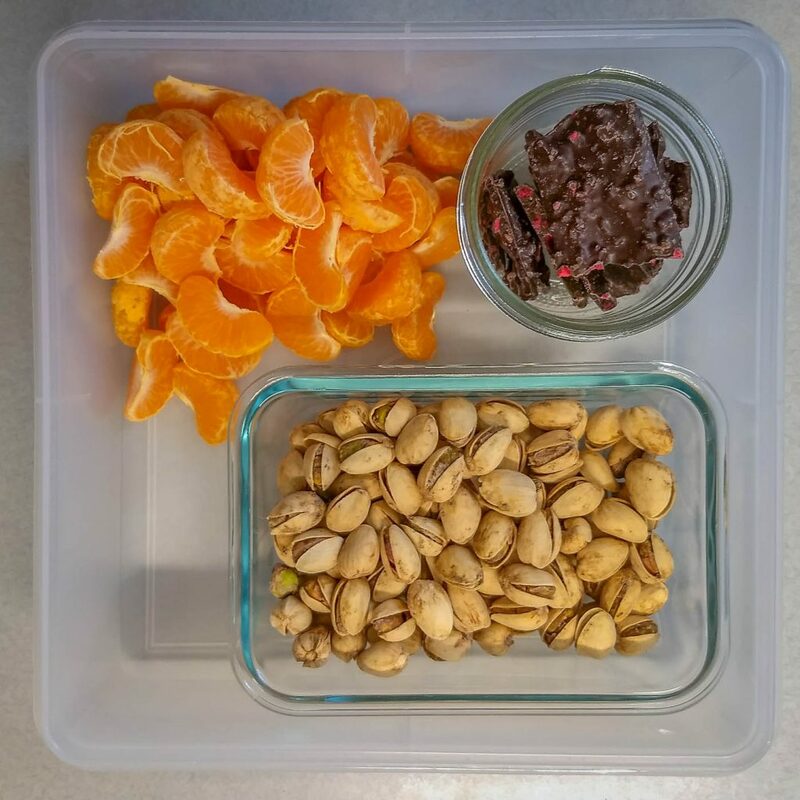 I’ve written several posts before about the snacks I pack and titled them “healthy work snacks” (here, here, and here). But I got to thinking that really what I’m putting together are healthy portable snacks. These ideas could be useful for car trips, outdoor concerts (the kind that let you pack in your own food), plane trips, days at the beach, etc. ; any time you’re away from home and might get hungry. 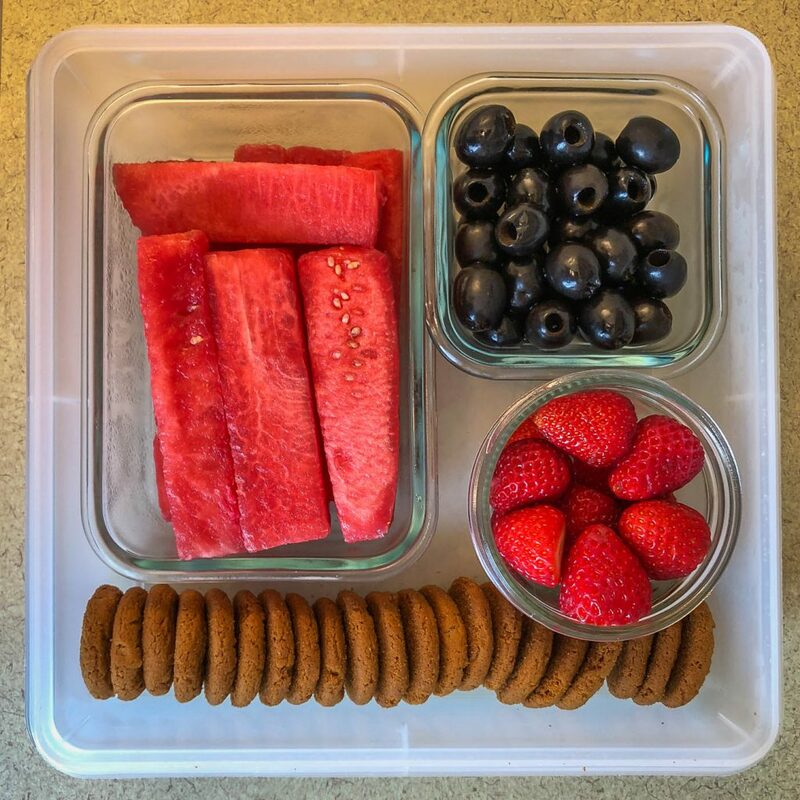 So today I have several ideas to share that hopefully will inspire you to grab a plastic (or glass or metal) container, get packing, and get snacking. 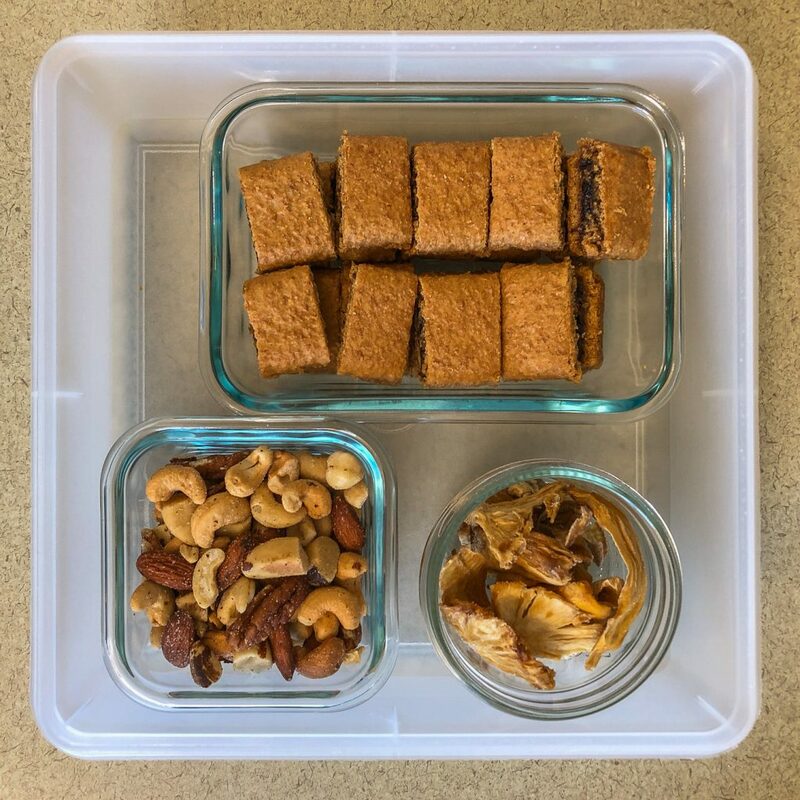 Please notice and appreciate the bento-like effort I’ve made to fit all snacks into a single square Tupperware using tinier glass and plastic containers. This makes for easier transport and serving. I’ve divided things up into two categories based on refrigeration needs. I’ve got a dorm-size fridge in my office at work which is where my snacks hang out during the day, but you could use an ice chest or insulated bag if you’re on the move. (Food) safety first! A friend at work warned me about these pistachios. And he was not wrong. It is incredibly hard to stop eating them. Fortunately, there is some research showing that we eat fewer calories when we have to work harder to get the food into our mouth. Good examples would be edamame in the pod and pistachios in the shell. We can’t just spoon them or dump a handful into our mouths without expending a little effort first to remove pods or shells, which slows down the calorie consumption. The fig bars are essentially a rif on a fig newton, but a with a little heartier exterior than the traditional cake-like pastry. They come in raspberry, blueberry, apple cinnamon, and a few other fruit flavors and have become a favorite at our house. And nuts are always a good snack, even with a little salt. They offer healthy plant fats, plant protein, fiber, and calcium. They also pack a lot of calories in a small amount so portion control is paramount. I hesitated to include the peanut butter balls on this list. The recipe calls for corn syrup and powdered sugar, which doesn’t quite meet my criteria for a healthy snack. 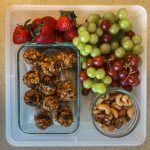 I did opt for natural peanut butter and crisped brown rice cereal, to try to take it more in the right direction, but they are definitely a candy-like treat. They were an absolute hit with my coworkers, so now I’m inspired to get the same result with better ingredients. That’s going on my recipe development To Do list. I have no hesitation recommending these no-bake cookies. They were sweet, chewy, incredibly moist, and pretty much perfect. They’re also vegan, gluten-free, dairy-free and whole grain. They are quite simply…a keeper. More cookies! As cookies go, at least these come in a good portion size: tiny. 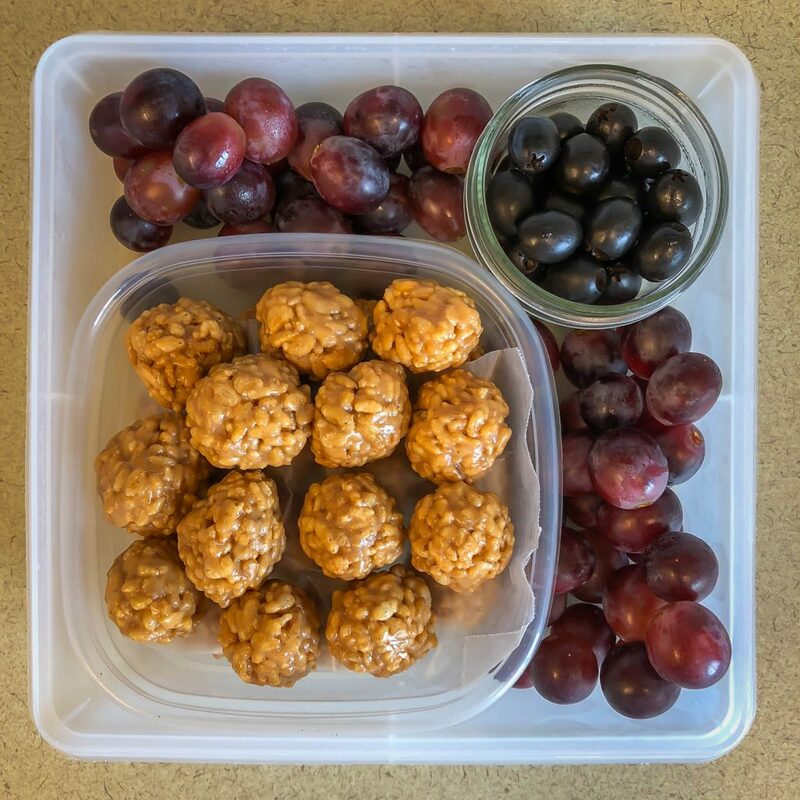 Because of this, one cookie is just 20 calories and they made a nice finger-food style snack alongside the fruit and olives. The cashew clusters are surprisingly good and so satisfying to pop in your mouth. The brownies, however, are on another level entirely. Perfectly underbaked and positively bursting with coconut flavor, they taste indulgent. All the more exciting to realize the ingredient list is simple and made up of real foods like flaxseed, egg whites, safflower oil and cocoa powder. (If you’re intrigued, they also come in chocolate, cappuccino, and dark cherry flavors.) 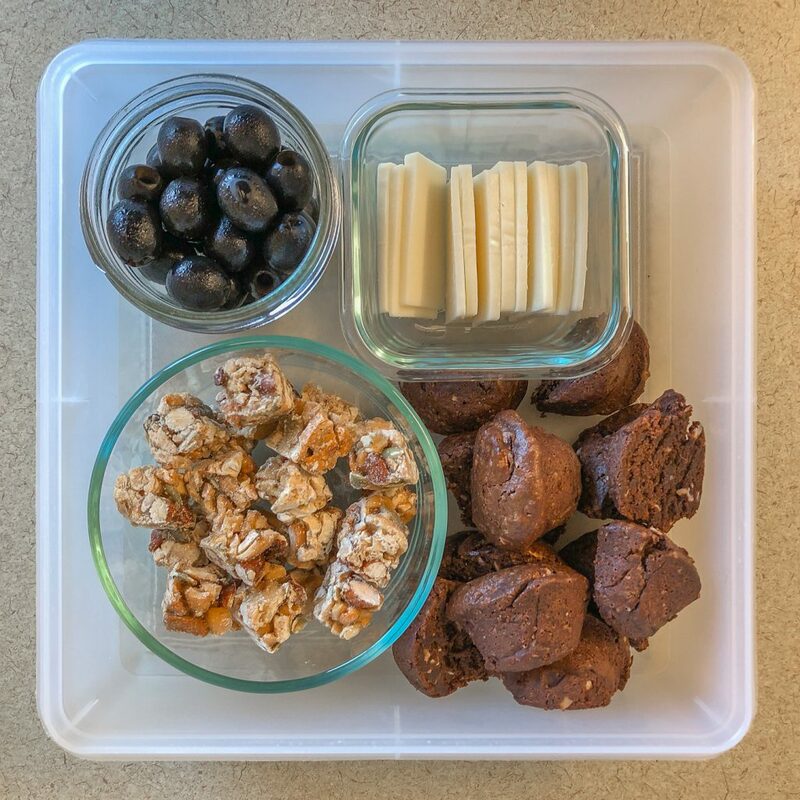 And in this mix of snacks, the olives and cheese provide the salty/savory counterbalance to all this sweetness. OK, the hazelnuts might be hard to come by unless you order them online. They’re from a local hazelnut orchard near me in Lynden, Washington and I can buy them at the farmers market. But depending on where you live, you might have a local nut grower who offers some interesting products, like these flavored ones. As for the mango I was happy to discover this unsweetened brand at Costco. I love the dried mango you can get in bulk but it’s always covered with a crunchy layer of added sugar. This stuff is just cut and dried mango; nothing extra. I had high hopes for the snack bites. 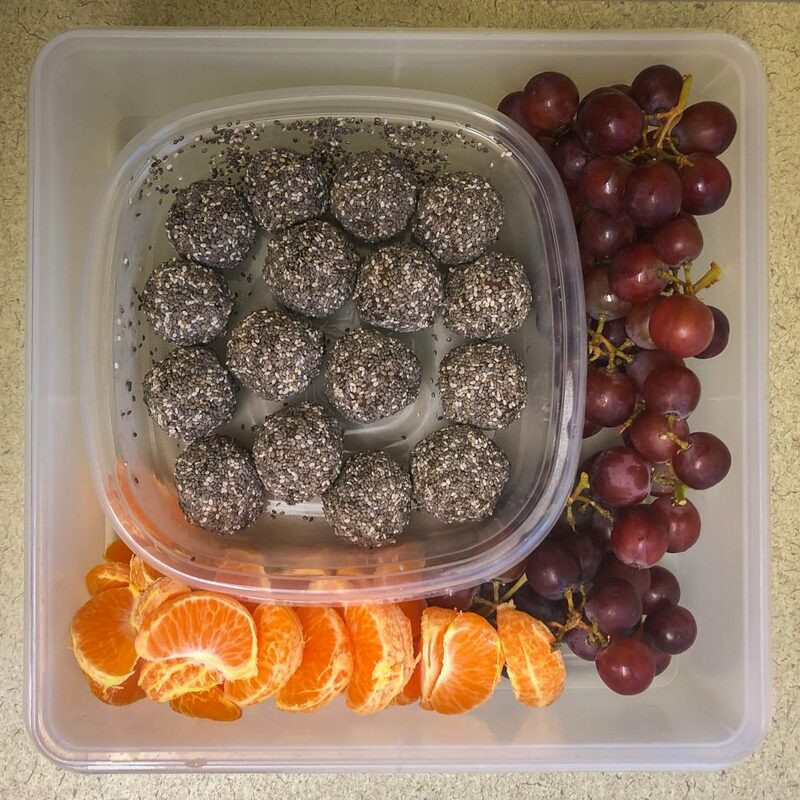 The recipe was rated well on Minimalist Baker’s site, and it struck me as a unique way to combine some of my favorite healthy ingredients like cacao nibs, tahini, and hemp seed. The folks at work who ate these little nuggets were split 50/50. 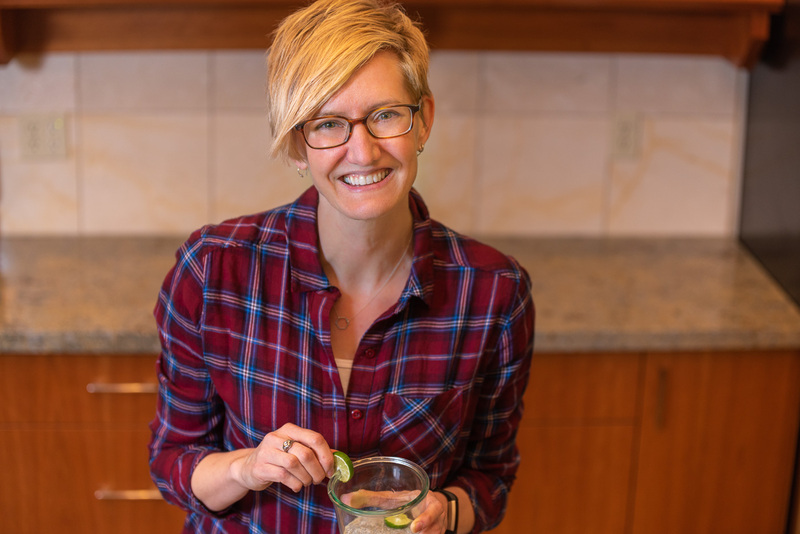 Some found them to be delicious, not-to-sweet fat bombs, while others were looking for more of a cookie or candy experience and were left wanting. I’ll leave it up to you if you choose to roll the dice, and make the recipe to decide which side of the 50/50 your taste buds fall on. The texture of these bites was indeed fudgy and brownie-like, and I enjoyed the crunch of the chia seeds on the outside for contrast. I ended up making this recipe twice as I felt the salt was overpowering in the first batch. I cut it down from 1 teaspoon to 1/2 teaspoon for batch #2. And as you can see from my fruit choices, I was packing these snacks in the winter and relying on what was available seasonally in the produce section. The pistachio squares are very similar to the Cashew Clusters listed above, and I also found these at Costco. They are convenient, crunchy, nutty goodness. The Cranberry Lemon Bites were a hit with some of my coworkers and shunned by others, mostly because of their texture. Something about the almond flour and coconut flour together made for a unique mouthfeel. The tangy lemon flavor and sweet-tart cranberries was a nice flavor combination. As usual, there were some repeats in this list. My coworkers have declared a love for olives, so I try to include them often. Fruit is always a reliable go-to and slicing cheese or pouring out nuts takes just moments when I’m pulling snacks together the night before. 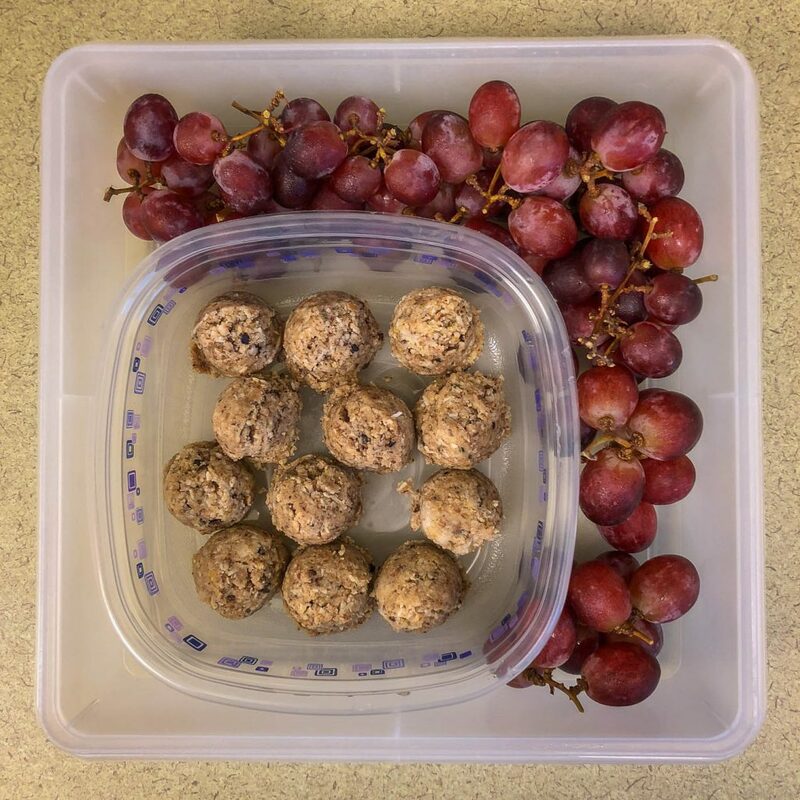 As you can probably tell from my comments above, I’m still experimenting with balls and bites recipes for my snack packages. Sometimes they’re a hit, sometimes they’re not. These types of recipes work well because I’m looking for sturdy finger foods instead of fussy appetizers. 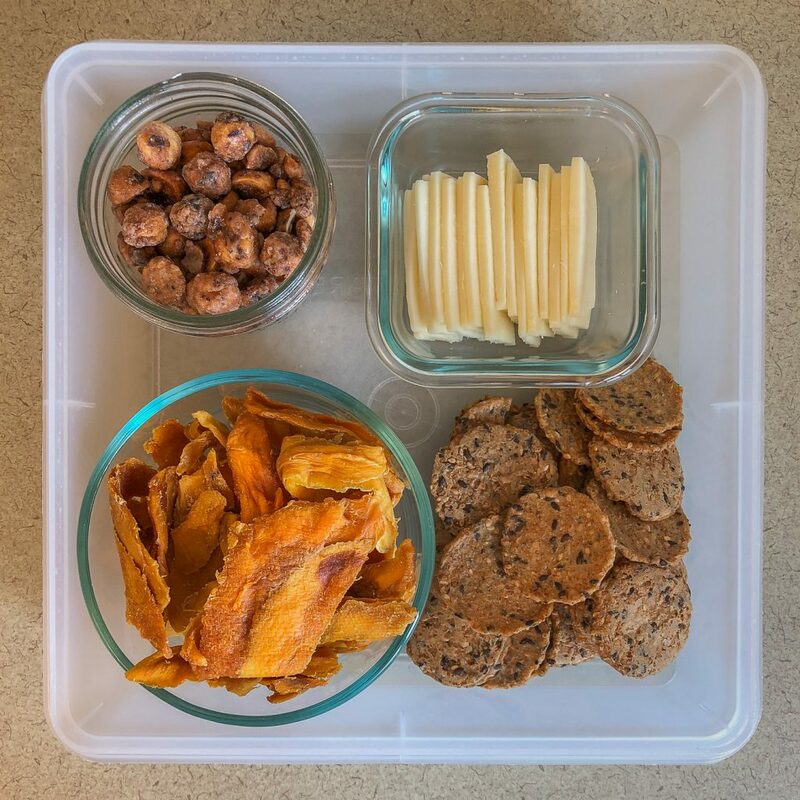 Hopefully the next time you’ve got an adventure or outing planned you’ll head out the door with your own ready-to-eat snacks so you’re absolutely, totally, and in all ways prepared when your snack craving hits. What new ideas do you have for me? 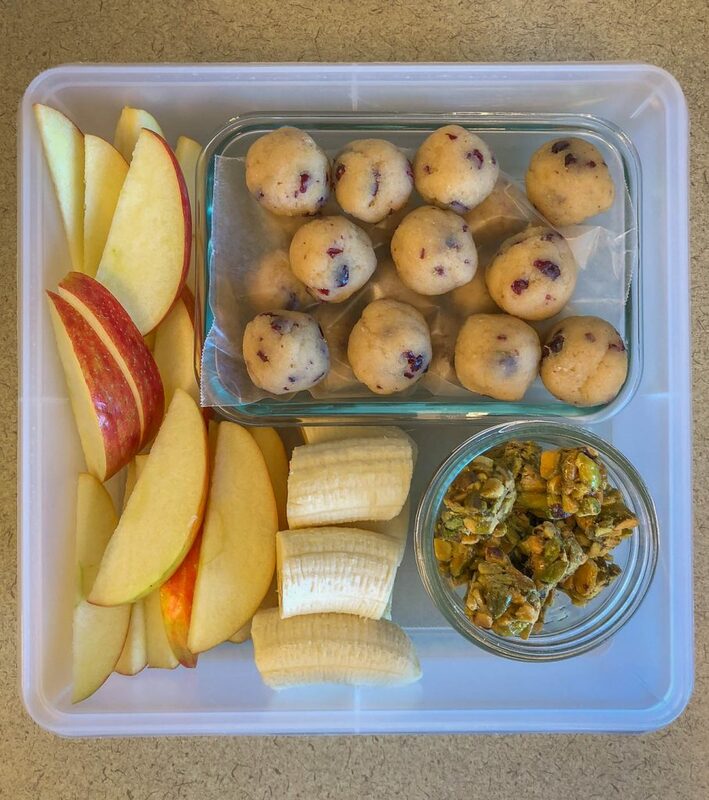 What are you favorite traveling snacks? 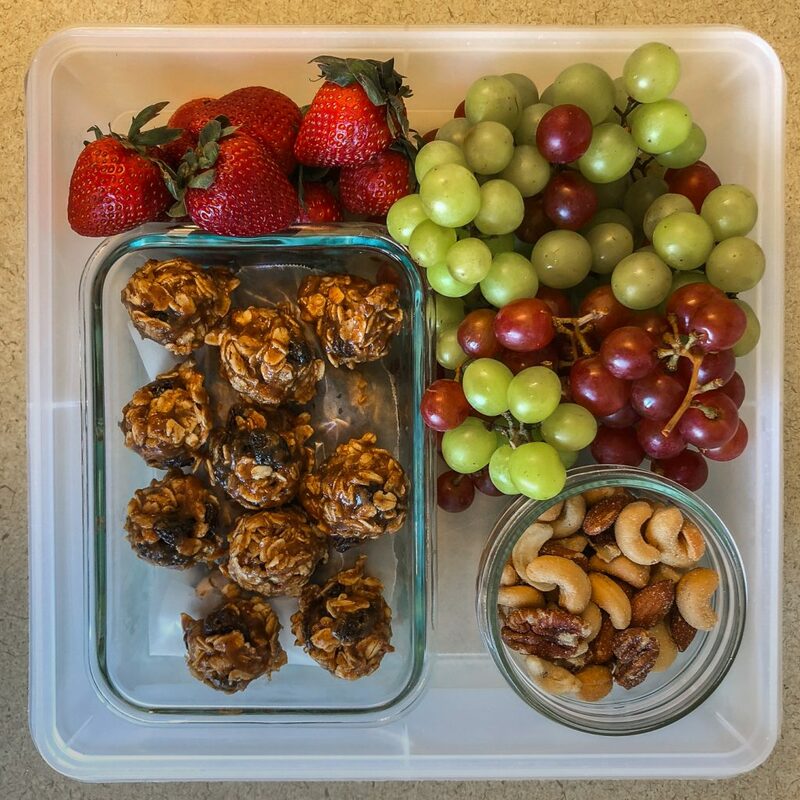 Fruit and nuts are always a good portable snack option.